Decorated and plain choices for storage or gift giving. 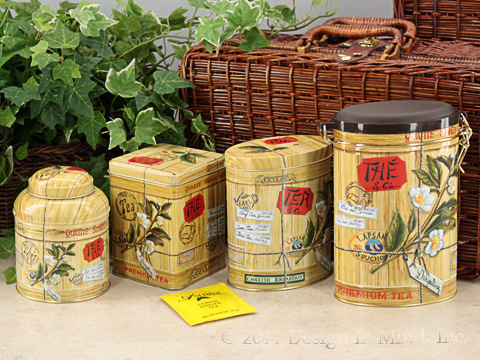 Embossed decorated tins by Virojanglor and plain tins provide beautiful and functional tea storage. The patented airlock polycarbonate jars seal tightly and are unbreakable. Antique embossed design tins. Available in 3 sizes. Domed Lid: 3.5 dia x 4 inches high. 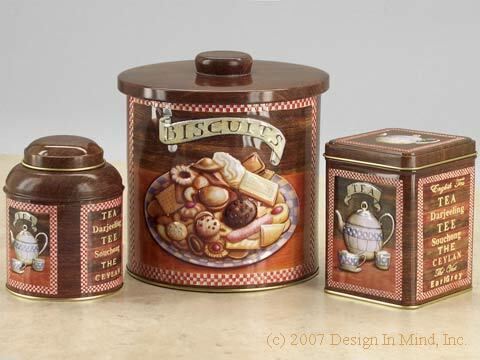 Airtight biscuit tin: 6.25 dia x 7 inches high. Square: 3.5 x 3.5 x 4.5 inches high. Medium Tin: 40 gram (1.4 oz.) 3 dia. x 2 in. high. Large Tin: 75 gram (2.5 oz.) 4 dia. x 2.5 in. high. Small Tin: 25 gram (0.9 oz.) 2.5 dia. x 1.75 in. high. Capacities are approximate and will vary with the type of tea used. Unique design polycarbonate canisters feature an air-lock seal to keep the lid on tight and the tea fresh. Push button releases the seal for opening or closing the canister. Small - transparent green tint with black lid - 2.875 dia x 6 inches high, holds 4 oz. Large - opaque dark green - 4 dia x 8 inches high, holds 1 lb. Capacity is approximate and will be less with bulkier teas. 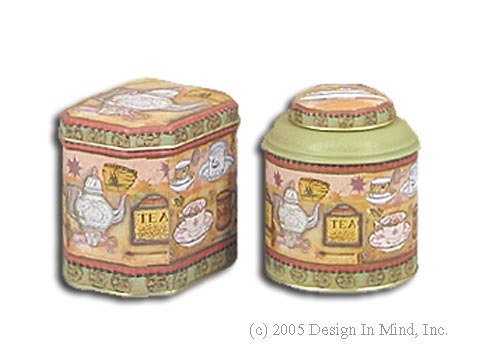 Tea themed tins in green and gold colors. Available in 2 styles. Cut corner tin: 4.5 x 3.3 x 4 inches high. Round domed tin: 3.5 dia x 4 inches high. Botanical theme in neutral colors. 4.25 dia x 3.5 inches high. 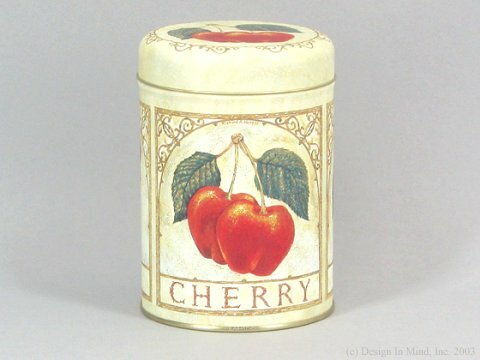 Classic fruit design includes cherry, pear, and lemon designs around each tin. Dimensions: 4 dia x 6 inches high. Capacity: 12 oz. of a typical black tea. Flat rectangular stacker boxes include metal nameplate frame and removable lid. Great for organizing. Choice of burgundy or green. Each box holds about 100 teabags. Box dimensions: 10 x 7 x 3 inches high. Embossed Tea Labels designs with a crackle finish. Armoire: 4.5 x 2.5 x 3 inches high. Caddy: 3 x 3 x 4.5 inches high. Square: 3.5 x 3.5 x 4.5 inches high. Round: 2.5 dia x 3.5 inches high. Unique design bamboo canister set includes three canister sizes. Each includes a plastic liner and a silicone seal to minimize air circulation. Medium - 4 in. square x 5.5 in. high. Large - 5.75 in. square x 7 in. high, holds about 0.5 to 1 lb. Capacity is approximate and will be less with bulkier teas. Made in China. 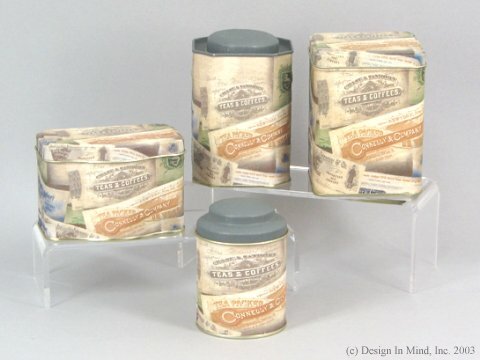 Colonial Tea embossed design tins. Domed Lid: 3.5" D x 4" H. Holds up to 4 oz. of tea. Square: 3.5" x 3.5" x 4.5" H. Holds up to 4 oz. of tea. Oval: 4.25" x 3" x 5" H. Holds up to 4 oz. of tea. Airlock Oval: 4.5" x 2.75" x 7" H. Capacity: 0.5 to 1 lb. of tea.